Suburban Times writer Joe Boyle wrote about hedges and other bushes drying up and turning brown all over Lakewood. He’s worried about fires starting and spreading. I loved his article and sent him a comment: “Joe, I think you should re-title your piece: The Planted Dead. I know exactly what you’re talking about and the problem goes well beyond Lakewood. Over our latest long, hot summer I’ve watched juniper tams turn brown along with other evergreens. We may eventually have to worry about Douglas firs, too. I’ve also begun to see more and more southwestern plants growing heartily here in Pierce County. Can massive cacti and roadrunners be far behind? We already have the coyotes. A few years ago we had a large cedar removed. A mountain ash next to it had a few years of life left in it. It had lived in the shadow of the cedar for years getting some sun. My Mountain Ash article: A few years ago we had a large cedar removed. 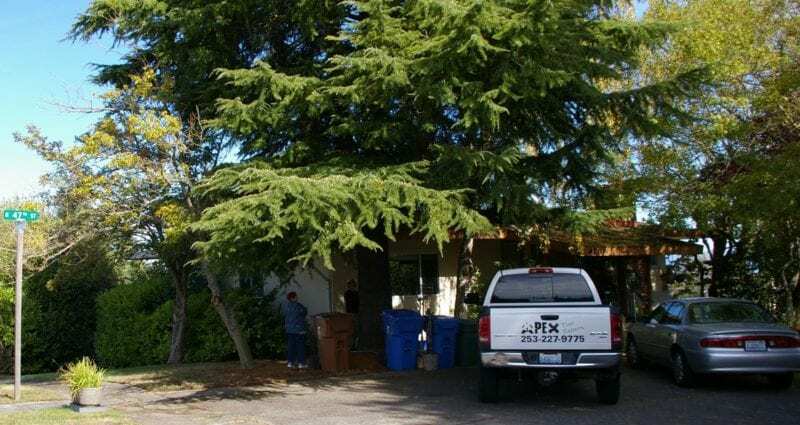 We hired Dan Folk of Apex Tree Experts to not only cut down the tree, but to advise us on the health of the nearby trees as well. The cedar protected several birches. Without the cedar they very were vulnerable. We had lost several of them in a previous ice storm. Also, nearby was a fruit tree and a mountain ash. The fruit tree had quite a bit of rot and so it went under the saw immediately. The mountain ash had a few years of life left in it. It had lived in the shadow of the cedar for years getting some sun. This last summer my wife, Peggy got on my case about the mountain ash in our yard. She wanted me to water the tree. I thought she was crazy . . . I mean I thought this was beyond all . . . well . . . I reminded her of what we already knew from Dan. The tree only had a few years to go. Peg didn’t care. She wanted the tree watered. So, against my better male judgment I read about watering trees. This last summer my wife, Peggy got on my case about the mountain ash in our yard. She wanted me to water the tree. Trees have deeper roots than flowers and for trees you need to water a larger area. You need to water out as far as the branches extend. So, if the canopy of limbs and leaves covers a thirty foot circle, then you need to water a thirty foot circle. The mountain ash is on a slight slope, so that means you have to water a little above the tree canopy on the slope so the water will soak in down hill. I bought some extension hoses and an inexpensive sprinkler that gave me the right pattern for under the tree sprinkling and began soaking that area. We don’t normally water our lawn. When it gets brown in the summer, we know that it will green up when the rains return in September and October. This may not be true in the future, but for now our lawn always comes back. Happy wife, happy life . . . my wife saw the tree perk up. It was beautiful. Happy wife, happy life . . . she saw the tree perk up. It was beautiful. Peggy was thrilled . . . I’m a hero for a couple hours of work and about $40. I think we are going to see more of our local plants and even our larger evergreens begin to die if we have a similar summer in 2018 and global warming keeps doing its thing. I think our mountain ash will make it trough this winter and next summer, but come next fall I think it will have to go. Perhaps, we can plant another in its name. Thank-you! To think that our trees don’t need water when the they typically get that and is exactly why they grow here so well is absurd. No water-no Evergreens. Thank you for both reading . . . and writing.